Wireless Internet connectivity in my home seems weak in portions of the house, despite indications on each Mac of a strong signal. What experience do you have with wireless range-extender products — not hardwired? 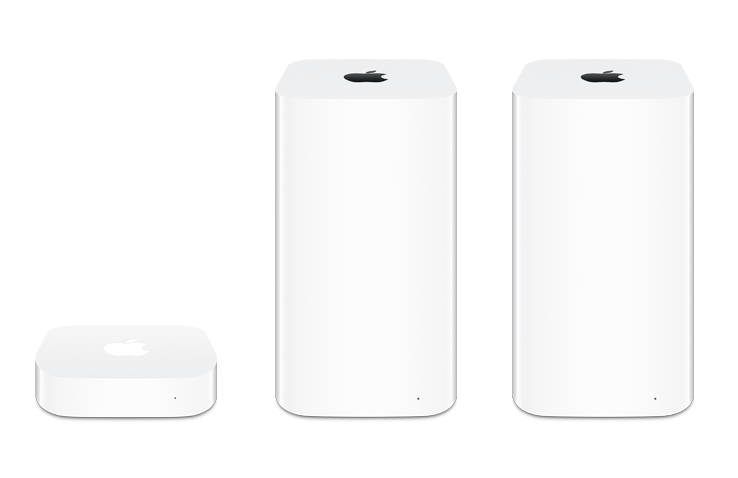 If you have an Apple AirPort Extreme, adding a (smaller & less expensive) Airport Express usually works better than a 3rd-party “range extender”. Just plug the AirPort Express into a wall outlet (no cable necessary) in the room where the signal is weak and have it wirelessly “join” your AirPort Extreme network to extend your coverage. But — Before you spend ANY money on extra hardware, try relocating your base-station. Just moving it to a different position within a room can result in a much better signal to the rest of your home. When I had my original AirPort router next to my cable modem on a low table, in one corner of my house next to a window overlooking my neighbor’s house, the signal in the bedrooms at the other end of the house was very weak. Moving the Airport around within the room really improved the signals throughout the house. People can get in the way. The human body is 75% water, and water absorbs WiFi signals. So, the best place for a WiFi access point (or AirPort) is up high: head-high or higher. (This is why every school classroom with a WiFi access point has it either in the ceiling or mounted high on a wall.) My AirPort Extreme sits on top of a high bookshelf. Walls also absorb WiFi (yes, even “drywall”, due to the humidity in Hawaii), but WiFi signals pass through openings, like doorways or windows of almost any size, and effectively scatter around nicely into other rooms. With my AirPort next to an outside window, most of its signal was wasted out the window towards my neighbors. When I moved the AirPort away from the the window, it really improved signals in other rooms. Metal reflects WiFi signals. Which can actually help scatter signals around a home. But a large metal object like a refrigerator, or even a mirror can adversely affect the WiFi signal. Moving my AirPort just a little to one side improved the signal to the back bedroom (on the other side of the refrigerator & microwave in the kitchen, and behind closet door mirrors). While signal strength is important, so is the signal/noise ratio. Radio frequency “Noise” can come from many things — microwave ovens or cordless phones for example — but these days, noise more often comes from other nearby WiFi setups. If your base-station uses 2.4GHz, and your neighbors do as well, radio noise can become a problem. That’s when having newer router models, especially the latest AirPort Extreme or Airport Express which provide 5GHz as well as 2.4GHz channels, is an advantage. 5GHz channel being less crowded is less noisy, and it can even supply more signal “thrust”. You will however, need a newer Mac or iOS device in order to take full advantage of 5GHz channels. BTW — You can definitely find other brands of “dual band, gigabit” routers, but in my opinion most of those aren’t quite as good, and will cost almost as much, as an Apple AirPort Extreme. Thanks to Bob Cunningham (WH6ETT for you HAMs) for contributing to this article. Where on this page do I ask a question? I need help soon. This page has rejected my correct digits answer twice. HELP! !